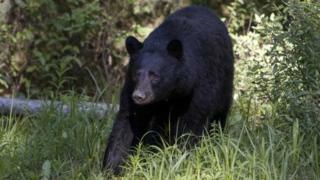 Officials in Canada's Alberta province have said they plan to ban spear hunting after an American posted a video of himself impaling a black bear. Social media users criticised US hunter Josh Bowmar, 26, for uploading a 13-minute video showing the hunt. Though spear hunting is legal in Alberta, officials have said they are looking into whether Mr Bowman could face charges for the kill. A ban on spear hunting is expected to be in place this autumn, they said. Alberta Environment Ministry spokesman Kyle Ferguson said the agency had asked Fish and Wildlife officers to launch an investigation into whether Mr Bowman should be charged under current laws. The video, which was posted on YouTube in June and taken down on Monday, shows Mr Bowmar setting a trap for the bear in northern Alberta and launching a spear, with a camera attached, at the animal. "I drilled him perfect," Bowmar said to the camera, according to Reuters. "That was the longest throw I ever thought I could ever make." Spear hunting is illegal in Ontario, Canada's most populous province, but not in Alberta. Mr Bowmar said he has received hundreds of death threats and has been forced to cut back on his social media use because of the backlash. The Ohio native was a competitive javelin thrower in college and currently runs a fitness company. "It's extremely frustrating to me," he told the AP. "I didn't do anything illegal. The bear died very humanely. The truth is I honestly care more about animals and hunting than anybody could." Mr Bowmar said the bear ran 55 metres (180 feet) before it died and argued that a spear was a more humane weapon than a bow, Reuters reported. Mr Bowmar is not the first American to spark outrage in the sport of hunting. American dentist Walter Palmer came under fire last year for killing the black-maned lion, Cecil, with a bow and arrow outside the Hwange National Park in western Zimbabwe. Mr Palmer was not charged because officials said he had obtained legal authority to kill the animal.